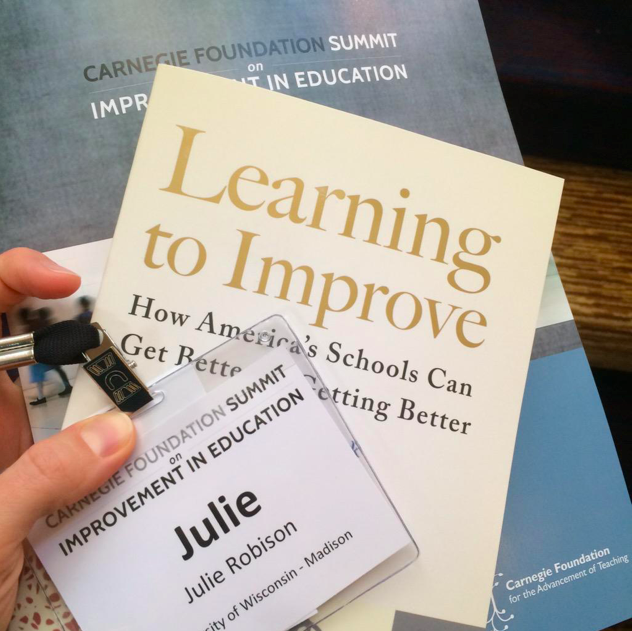 Here I am at the Carnegie Summit. What am I hoping to learn and come away with? This reflection ends up just being more questions. This started last fall when I read the paper on Networked Improvement Communities, and it felt like it was a roadmap to how I want to work with educational systems. So I’ve come to the conference to learn more about it, hear what people are doing and what they’re thinking about, and find out how I can maybe get involved. If I had to pick a content interest that I have read about and am interested in it would be the development of a strong teacher workforce, and how districts can use a framework like that to reflect on where they are focusing their resources to drive innovation. But in my role as a researcher, how can I work with districts and the improvement science model? What do improvement scientists need from researchers? One specific aspect I want to understand are examples of measurement that practitioners are using other than test scores and aside from post-measures like retention rate or success rate. What can I measure in real time? Previous Post My first Wikipedia edits!